Thank you for taking the time to check out ChasingTinyFeet.com. I am a stay at home home mom, mother of a 1 year old little boy who keeps me very busy, and wife to a hard working man whom I love very much. I hope to be able to share some tips, ideas, and knowledge that I have picked up along the way. I will be posting life as it happens with ideas that help get me though the day, all while trying to stay ahead. Hopefully you will find answers to make your everyday life a little easier too. Please be patient while I get things up and running. 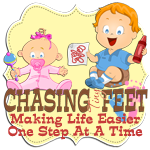 Check out ChasingTinyFeet.com often and enjoy!